(June 20, 2012) The Steele Creek Residents Association is opposed to Rezoning Petition 2012-059. This rezoning will allow the construction of a Bojangles restaurant, Circle K convenience store, and two other commercial buildings on Steele Creek Road across from the new Dixie River Road just south of I-485. The Association does not object to the use planned for this site. Instead, the opposition is based on the likelihood of a series of small rezoning requests that could create a strip of random commercial development along Steele Creek Road. This corridor is a major gateway to Steele Creek off I-485, and development should be based on a consistent, comprehensive plan that could be used to coordinate future commercial development in this area. This is an opportunity that should not be missed! I am writing to you today on behalf of The Steele Creek Residents Association to let you know we stand in opposition to rezoning petition 2012-059. This spot rezoning, we fear, will trigger a series of small rezonings resulting in a patchwork of development for this area. 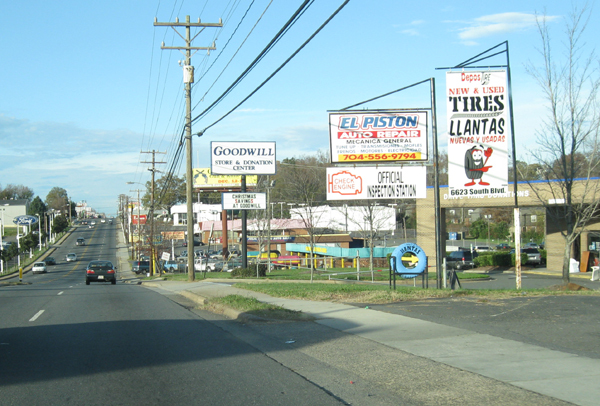 This location at I-485 and Steele Creek Road is a major gateway into our community. Having a comprehensive plan for this area is the only option to assure an attractive gateway. We respectfully request that you deny this petition and ask the developer to go back to the adjacent property owners and have them join in to develop a comprehensive plan for this gateway to our community. Including the large tracts owned by Gambrell and Grier families behind this site, there are more than 300 acres that represent an opportunity for a quality plan. This process should include coordination with Pappas Properties and Steele Creek (1997) LP across Steele Creek Road, assuring consistent monumentation, signage and landscaping. We still have an opportunity to make this a “signature entrance” to our community. We can certainly manage a bit longer without a fast food and convenience store in order to have it done well for the decades to come. If the demand is great and immediate, there is appropriately zoned land directly across Steele Creek Road today. Please let’s take the time now to do the project well! The Steele Creek Residents Association would appreciate your support in the matter.